What Are The Pros And Cons Of A Virtual Workplace For Start-Ups? 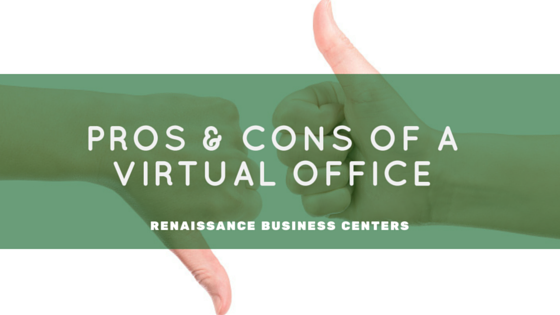 Virtual office offers a number of benefits for the owners of the new business. So, if you are heading up a start-up company and looking for a quick and easy solution when it come to your office. The comfort of a virtual office is truly unequaled. You can set up a virtual office within a fraction of minutes by booking it online. Setup from absolutely anywhere in the world with the grasp that you will have an official mailing address at a monthly fee. The start-ups do not have the cash flow to make it big forward purchases. Setting up a head office can be extremely inimical when talking about your cash flow but a monthly fee with a virtual office may help you to spread the cost over a period of time. Remember, a virtual office is also much low-priced than renting a physical office space. Virtual office not only will provide you with a mailing address that you can refer your clients and suppliers to, but it also provides you with the additional services such as basic messaging services, phone answering, hot desks or the meeting/ conference room hire. Running a physical office means that you are stepping up for the high utility bills, whereas a virtual address can save you the overheads of mounting utility bills but you can go for promoting your green approach to business by reducing your carbon footprint. SO, without stressing about how will you manage an office, you can completely focus your time more effectively. It is assumed that without the daily commute times, employees can be much more productive in the work they do respectively. Virtual office can often furnish you with a state of the art facilities and access to the equipments that would ordinarily cost a lot of money. Some of the virtual offices can also proffers you with the additional services at a cost, such as large meeting room or video conferring facilities. So, that you can explore more about the state of art facilities available in virtual offices and have a virtual mailing address with one of the world’s most reputable companies. Like any other thing else, a virtual office has its disadvantages as well as the merits – and however it is a fabulous solution for brand building small businesses, expanding the businesses and the start-ups,but every company is different and it is not for everyone out there. Here are some of the demerits you may want to consider before you sign up to a virtual contract. As you can really reserve the meeting rooms and hot desks, there is no such place called the true physical space for day to day work. In case you have a fixed number of employees within your company and daily communication is essential, not to forget a virtual environment may not be the most nurturing one for most. This can really be an extremely cost-effective and convenient alternative for the start-ups to choose from, once businesses start to grow this may not be the most efficient way of working. So, growing businesses which needs a much dedicated team and focused resources may need to look at expanding into a physical office premises. In case your company’s physical presence is essential in doing the business then you can go considering to have a physical office space. Whereas on the other hand, if your company does a business virtually and your online presence or the storefront is required than your physical office premises, then using the services from the best virtual office space provider in your area is the best way to go for. Assess according to your needs and then consider the options carefully. Remember, do not follow the trends for the sake of it: But Focus on your business and your clients’ requirements and then respond accordingly.